With the concerted effort Apple put into redesigning its flagship Mac Pro desktop, the company was able to shrink chassis size substantially compared previous designs. WaterField Designs is taking advantage of the hard work in a new case made to transport the powerful machine into the field. The Mac Pro Go Case holds nearly everything on-the-go professionals need to transport and operate a Mac Pro in the field, including a pocket for a full-size keyboard, a sack for the power cable and a mouse and extra space for other peripherals. Standing 9.9 inches tall and weighing in at 11 pounds, the Mac Pro crams a boatload of power into an extremely small package. This miniaturization has facilitated a variety of new applications for the professional-level machine, including in-the-field assignments once limited to Apple's range of MacBooks. With a shiny aluminum sheathing that also helps channel air to critical components, owners want to keep the casing as dent-free as possible. To that end, the Mac Pro Go Case features internal padding and a plush liner to protect against bumps and scratches. A velcro closure is used to seal up the case instead of a metal zipper. At the bottom of the carrier is a plastic plate to protect the Mac Pro's base and fan intake, while a removable disc-shaped soft pouch sits on top of the computer and holds cables and accessories. Extra space above the disc allows for extra cable storage. Outside, the case is skinned in ballistic nylon and features a scratch-free keyboard pocket. Two loops at the bottom help users pull the Mac Pro out of its cocoon and a detachable shoulder strap is included. 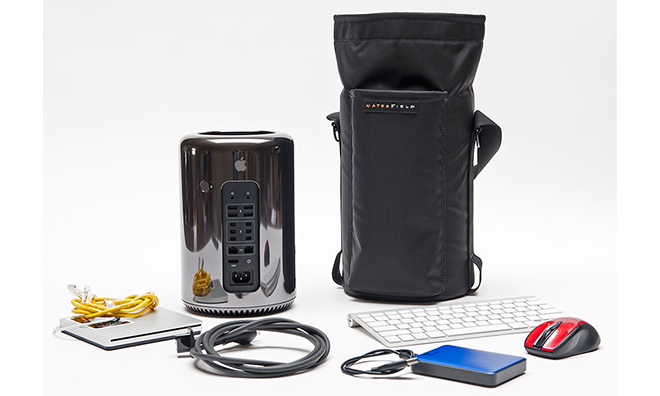 The WaterField Mac Pro Go Case is available now for $129 from the company's website.